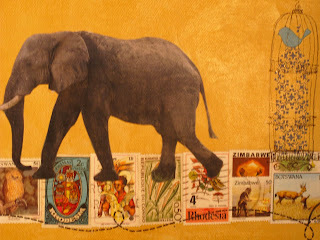 This and other collages in the safari series are 6x8 inches and available for $60. The wooden gallery canvas is light weight and easy to hang without framing. The resin finish brightens colors and makes for a washable surface. Wasn't I just admiring this??? I always have such a good time with you. I can't wait to see your jewelry on Etsy.